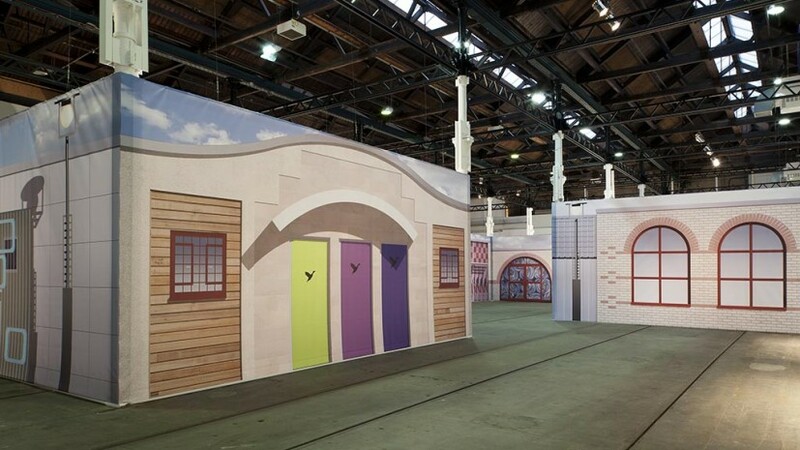 Image: Matthew Darbyshire, An Exhibition for Modern Living, 2010. Mixed media, dimensions variable. British Art Show, Installation View, Hayward Gallery, London, 20111. Photo Kieron McCarron. Courtesy the artist and Herald Street, London. 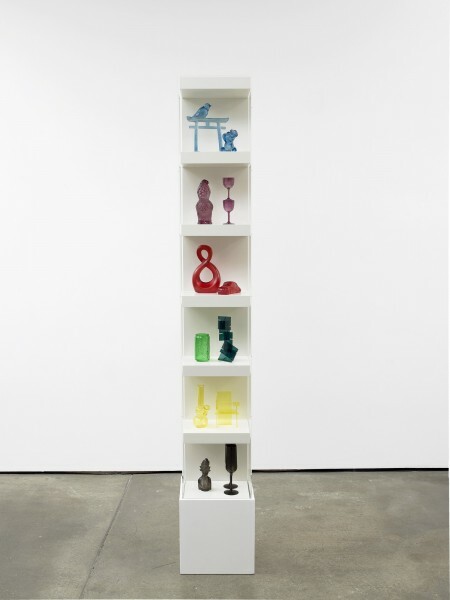 Image: Matthew Darbyshire, Untitled: Shelves No. 9, 2011. Various glass and plastic components, shelving units, and perspex cases, 140 x 110 x 30 cm. Courtesy the artist and Herald Street, London. 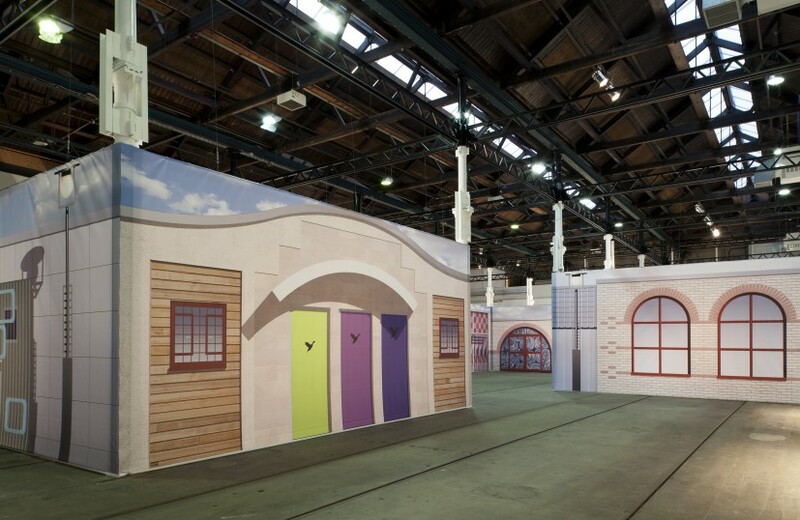 Image: Matthew Darbyshire, T-Rooms, Installation view, Tramway, Glasgow. Photo: Keith Hunter. Courtesy the artist and Herald Street, London. 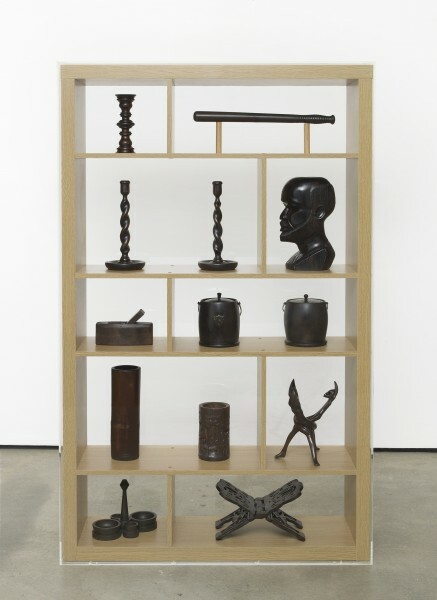 Image: Matthew Darbyshire, Untitled: Accessorised Column No. 5, 2012. Various plastic, glass, and resin components, shelving units, and perspex case, 215 x 30 x 30 cm. Courtesy the artist and Herald Street, London. Image: Matthew Darbyshire, Untitled: Asymmetrical Shelf Display No. 3, 2013 Antique wooden artefacts displayed upon wood-effect support, perspex case, 162 x 102 x 31 cm. Courtesy the artist and Herald Street, London. 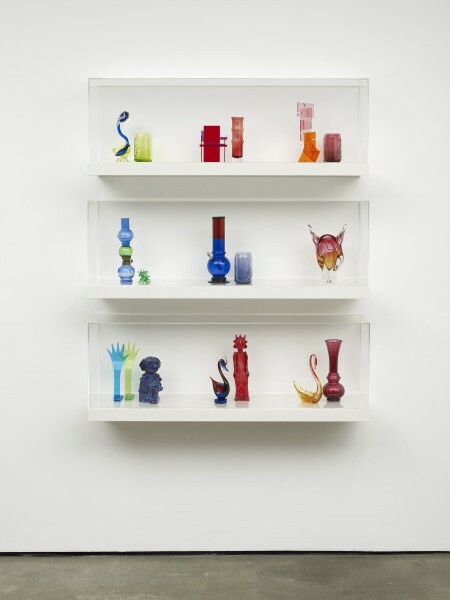 Image: Matthew Darbyshire, T-Rooms, 2012. 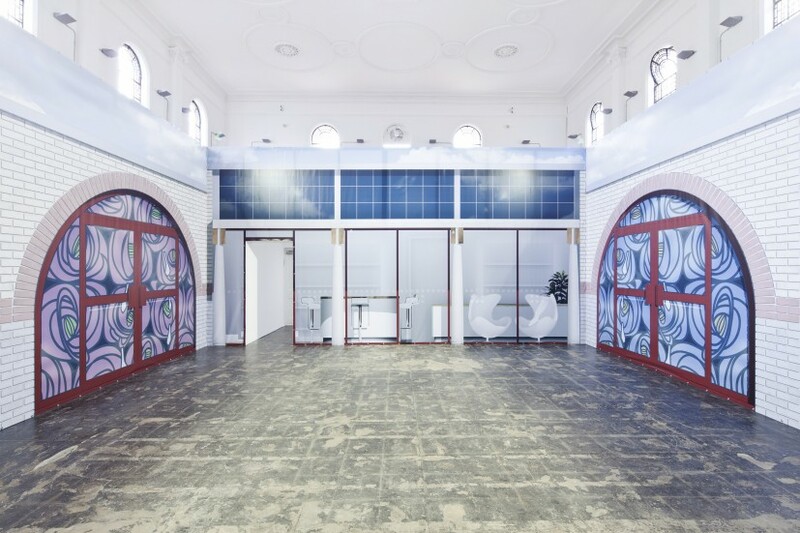 Installation view, Zabludowicz Collection, London. Courtesy the artist and Herald Street, London. Matthew Darbyshire’s work explores notions of social and cultural critique through playful approaches to urban architecture and design. For the British Art Show 7 in 2011, Darbyshire’s An Exhibition for Modern Living at the Hayward Gallery presented a garish tableau of mid-range interior design, including telephones, lamps, stools and bookends. Whilst the work’s title alludes to a 1949 exhibition at the Detroit Institute of Arts which celebrated innovation in design and mass production, Darbyshire’s interior presents a more dystopian view of consumer culture, seeking to question and critique notions of modern taste. His current installation, Oak Effect, at the Bloomberg Space, London, sees the gallery transformed into a fantastical showroom window housing a collection of ethnographic and design objects from the Tyne and Wear Archives and Museums Collection, displayed within a framework comprised of dining tables, worktops and nesting tables. The combination of real and synthetic woods and original artefacts creates an unsettling tension between the authentic and the artificial, continuing Darbyshire’s investigation into the visual language of commodity culture. Matthew Darbyshire (born 1977, UK) lives and works in London. He studied Fine Art at the Slade School of Art and at the Royal Academy Schools in London. Solo exhibitions include: Oak Effect, Bloomberg Space, London (2013); T-Rooms Pt II, Zabludowicz Collection London (2012); T Rooms, Tramway, Glasgow (2012); Jousse Enterprise, Paris (2012); Herald Street, London (2011); Taro Nasu, Tokyo (2011); Funhouse, Hayward Project Space, London (2009) and Blades House Gasworks, London (2008). Group exhibitions include: Air de Pied-à-terre, Lisa Cooley, New York (2013); Kettle’s Yard Cambridge (2012); You Are Not Alone, Bangkok Art and Cultural Centre, Thailand (2012); British Art Show 7: Days of the Comet, curated by Tom Morton and Lisa Le Feuvre, (2011), Tate Britain Altermodern Triennial, curated by Nicholas Bourriad (2009), and ICA, Nought to Sixty (2008). In 2012, Darbyshire received the Stanley Picker Fellowship, Kingston University, and he is one of this year’s Associate Artists at Kettle’s Yard, Cambridge. Forthcoming exhibitions include Kettle’s Yard, Cambridge, the Hepworth Wakefield and FRAC Nord-pas de Calais, Dunkirk. Darbyshire is represented by Herald Street, London and Galerie Jousse, Paris. His work is in held in public collections including the Arts Council Collection, UK and the Government Art Collection, UK.